November 3 2011, Rotaract Blue hosted “Shades of Red”, an annual wine tasting event to benefit the Cayman AIDS Foundation. This annual event utilizes a warm and relaxed atmosphere in an effort to raise awareness about and encourage healthy lifestyle choices that prevent the spread of HIV/AIDS. HIV/AIDS education is one of Rotaract Blue’s key platforms. This year’s event was hosted at The Brasserie with the theme: “Night in Paris”. Guests were treated to exquisite wines from France specially handpicked by sommeliers Roberto Logioia Dette of Blackbeard’s and Harvey Setterfield of Vino Veritas. Exotic canapés by Brasserie's culinary team and soft music by Eugenio Leon completed a perfect atmosphere. 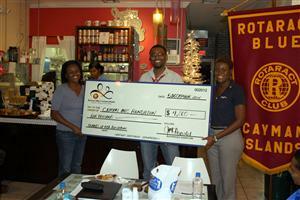 The event allowed Rotaract Blue to make a donation of CI$4,000 to the Cayman AIDS Foundation. On receiving the donation, Cherine Usherwood, Vice President of the Cayman AIDS Foundation, expressed deep gratitude and encouraged Rotaract Blue to continue its support of the Foundation. Rotaract Blue would like to thank the sponsors of Shades of Red: Blackbeard's, Butterfield Bank, Cayman Airways, Cayman National, DART Cayman Islands, David Goddard Photography, dms Broadcasting Ltd., Intec Research Production Services, Island Companies, LIME, Maples, UBS, Voss Water, and The Brasserie. The support of these organisations is invaluable in enhancing the awareness and prevention of HIV/AIDS.